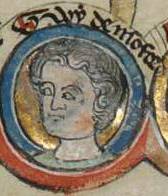 The fourth of Simon and Eleanor’s sons was born around 1244, perhaps at Kenilworth, where the family returned after Henry’s failed expedition to recover Poitou. It’s fitting that the first mention of this most warlike of the Montfort sons comes in battle, at Lewes, where he shared the joint command of a division with his brother Henry. He served as a castellan for his father until Evesham, where he was picked up wounded off the field and imprisoned in Windsor. He was later transferred to Dover for no other obvious purpose than to allow him to escape. The rest of his surviving family was already on the continent, and Henry and Edward figured the realm was better off cleared of the Montforts for good. Since his father was said to have been a ‘blood brother’ of Charles of Anjou, he soon found rapid advancement under Charles in his conquest of Italy and Sicily. At Alba in 1268, he single-handedly broke through the enemy’s lines, but by the time he rejoined his men, his helmet had become twisted around, blinding and suffocating him. He swung wildly to his left and right like a madman until a member of his squad was able to fix the wardrobe malfunction. Charles was clearly impressed and in 1270 named Guy as his vicar-general for the whole of Tuscany. His fortunes increased further with his marriage to Margherita Aldobrandesca, the heiress of an ancient local family. He was well on his way to becoming a powerful overlord of the region when his cousin Henry of Almain showed up. Henry was traveling in the party of the new French King Philip III and Charles of Anjou, who decided to stop in Viterbo to check on the progress of electing a new pope. Guy was also in the city, presumably to meet Charles, and according to Edward’s later account, Henry sought him out to make peace between their families. Guy’s brother Simon was with him at the time and together their answer was to come upon Henry while at Mass and hack away at him in front of the terrified congregation. Henry may or may not have been still alive when Guy dragged him by the hair out into the square, where he and his horsemen finished him off in a fashion that was meant to avenge the dismemberment of his father’s body at Evesham. All of Europe was understandably shocked by the brutal murder, but the Montfort brothers definitely felt that Henry had it coming. He not only sold out to Edward and his minions, but took part in the wholesale disinheritance that followed. He then more or less sealed his fate as far as the Montforts were concerned by marrying the daughter of their father’s mortal enemy, Gaston de Bearn. Edward could not have chosen a more unsavory henchman to send on a mission of peace. Immediately dispossessed by Charles, Guy was on the run for the next two years in Tuscany. At Edward’s urging, the pope finally took action, yet Guy was able to plead for a lenient sentence that involved little more than house arrest. Legend has him escaping again, making his way to France, even to Norway, but by 1281 he was back in service under Charles. His luck came to an end in 1287 when he was part of the Angevin attempt to reclaim Sicily. Captured by the Aragonese, he died in prison despite the best efforts of his family to ransom him. He left behind two daughters Anastasia and Thomasia, who provided the only known direct descendants of Simon de Montfort. Dante Alighieri was a young boy at the time and may have once even seen Guy before the murder in the company of his knights or after while he was eluding the authorities. For the murder of Henry of Almain, he placed him in the seventh circle of his Inferno, immersed in a river of boiling blood.